Q. 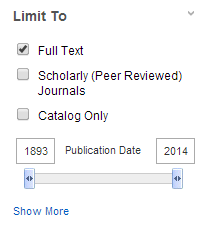 How do I get the full text articles (in EBSCOHost)? I need to be able to read the articles I have chosen, not just the abstracts. As a general note, here are the three options towards getting Full-Text. Option A, The Full-Text Limiter: The best way to insure that you get only full text articles when searching under Ebscohost is to check the "Full-Text Only" option in the left sidebar where there are many options for narrowing down results. If you are looking for a specific article, then it might not show up. Try Option B, then. Option A is most useful for people who are starting out research though it also helps to find specific articles. Option B, Finding the Source Journal: If you know the journal title, you can also go back to our homepage and then click on the Find a Journal by Title option. This will take you to the source periodical. Keep in mind that we might have the article in print only. In that case, our Journals are located in the north and central sections on the Second floor. Journals are sorted by title. You can use the title and date to find the article you need in the print copy. Option B is most useful if you have something specific in mind (or have a list of required journals). Option C, Interlibrary Loan: Make sure you have done option A and B first. If we neither have it electronically or in print, you may put in an Interlibrary Loan Request for it. This is not an immediate response, though, because it takes us a few days to get the article and then get it to you. Also, check to see which articles we do have in full-text because it might be that we have articles equal to or better than the one you got in the search already available. Option C is for those who need specific papers for their assignments but ones we do not have. If you need further help, or are having trouble finding a specific article, you can send that information on as an email (erefq@uah.edu or use http://libanswers.uah.edu to submit another query) then we can give more specific advice.